The Knights Templar, a fearsome and uncompromising order, were formed shortly after the First Crusade to protect pilgrims. Despite their origins, the order became hugely wealthy and operated the first banking system in Europe. 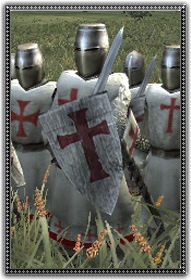 They were disbanded in 1307, after hundreds of Templars were simultaneously arrested and tortured in France on orders from the Pope and the King. Heresy being the main charge. Politics aside, they were famed warriors. Dismounted, these well armed and equipped warriors, are formidable troops in any melee.